For other uses, see The Italian Job (disambiguation). The Italian Job is a 1969 British comedy caper film, written by Troy Kennedy Martin, produced by Michael Deeley and directed by Peter Collinson. Subsequent television showings and releases on video have made it well known in the United Kingdom. Its soundtrack was composed by Quincy Jones, and includes "On Days Like These" sung by Matt Monro over the opening credits, and "Getta Bloomin' Move On" (usually referred to as "The Self-Preservation Society", after its chorus) during the climactic car chase. Lead actor Michael Caine is among its singers. In 1999, it was ranked #36 on the BFI Top 100 British films by the British Film Institute. In November 2004, Total Film named The Italian Job the 27th greatest British film of all time. The line "You're only supposed to blow the bloody doors off!" by Caine was voted favourite film one-liner in a 2003 poll of 1,000 film fans. The popularity of the film has led to parodies and allusions in other films and productions, including a 2003 remake and inspired a charity event that has taken place annually since 1990 and involves Minis and other vehicles featured in the original film, driving from the UK to northern Italy and back, visiting Grand Prix circuits, historic Italian cities and the locations in Turin featured in the film, while fundraising for children's charities. The event has raised nearly £2,600,000 so far. Charlie Croker is released from prison. He meets up with the widow of his friend and fellow thief Roger Beckermann, who has been killed by the Mafia while driving a Lamborghini Miura in the Italian Alps. Mrs Beckermann gives Croker her husband's plans for the robbery that attracted the hostile attention of his killers, which detail a way to steal $4 million in gold in the city of Turin and escape to Switzerland. Croker breaks back into his former prison to convince the powerful crime lord Mr. Bridger to finance the plan. Bridger, who has bribed almost all of the prison guards to work for him, initially rejects the plan, but changes his mind after he learns Fiat is set to build a new factory in China. With Bridger's backing, Croker recruits computer expert Professor Peach and a team of thieves and drivers. The plan calls for Peach to replace the programme in the computer that controls Turin's traffic control system, creating a paralysing traffic jam that will allow the thieves to escape with the gold in three Mini Cooper S getaway cars. After planning and training, Croker, his girlfriend Lorna, and the heist crew set out for Turin. Mafia boss Altabani and his underlings are waiting in the Alps at the same pass where they killed Beckermann. Altabani warns Croker that the Mafia are aware of the gang's intentions and smashes their Jaguar E-Type cars, sending Croker's personal Aston Martin DB4 drophead off a cliff. Just as Altabani is about to give the order to shoot the gang, Croker tells him that Mr. Bridger will avenge their deaths by driving Italian merchants in selected Britain cities out of business. Altabani lets them go, ordering them to return to England. Instead, they proceed with the plan, replacing the traffic control system's magnetic tape data storage reels. On the day of the robbery, Croker sends gang member Birkinshaw, disguised as a football fan, to jam the closed circuit television cameras that monitor traffic. The substitute data reel then causes widespread traffic chaos. The gang converge on the gold convoy, overpower the guards, and tow the armoured car into the entrance hall of the Museo Egizio. There, the gang transfer the gold to the Minis. Altabani recognises that "If they planned this jam, they must have planned a way out." Pursued by the Turin police, the three Minis race through the shopping arcades of the city, speed down stairs, jump between rooftops, and finally escape the traffic jams by a pre-planned route across a weir. The getaway is timed perfectly, and they throw off the police by driving through a large sewer pipe. As Mr. Bridger receives the cheers and adulation of his fellow prison inmates, the gang drive the Minis into the back of a moving customised coach. They then unload the gold and dispose of the Minis by pushing them off the mountainside. The rest of the gang, having sneaked out of the city in a minibus while disguised as football supporters, rendezvous with the coach in the Alps. On the looping mountain roads, driver "Big" William loses control of the coach. The back of the bus is left teetering over a cliff and the gold slides towards the rear doors. As Croker attempts to reach the gold, it slips further. The film finishes on a literal cliffhanger with Croker announcing: "Hang on a minute lads, I've got a great idea". Noël Coward, who played Bridger, was godfather of the director, Peter Collinson. Bridger's fellow convict and confidant, Keats, was played by Graham Payn, Coward's long-time partner. Lana Gatto was the nom de crédit of Hazel Collinson, otherwise known as Mrs. Peter Collinson. Michael Caine's brother Stanley Caine also appears as one of Croker's gang. The gang also included Robert Powell, in his first film role. Frank Kelly appears as an uncredited prison officer, also in his first film role. American distributors Paramount wanted Robert Redford to play the lead. According to a "Making Of" documentary, producer Deeley was unsatisfied with the four written endings and conceived the current ending as a literal cliffhanger appropriate to an action film which left an opportunity for a sequel. The documentary describes how helicopters would save the bus seen on the cliff at the end of the first film. The grateful gang would soon discover that it is the Mafia that has saved them, and the sequel would have been about stealing the gold bullion back from them. In interviews in 2003 and 2008, Michael Caine revealed that the ending would have had Croker "crawl up, switch on the engine and stay there for four hours until all the petrol runs out... The van bounces back up so we can all get out, but then the gold goes over." The bus containing the gold would crash at the bottom of the hill where the Mafia would pick it up. The sequel would then have Croker and his men trying to get it back. In 2008, the Royal Society of Chemistry held a competition for a solution that had a basis in science, was to take not more than 30 minutes and did not use a helicopter. The idea was to promote greater understanding of science, and to highlight the 100th anniversary of the periodic table, on which gold is one of the 118 elements. The winning entry, by John Godwin of Surrey, was: Break and remove two large side windows just aft of the pivot point and let the glass fall outside to lose its weight; break two windows over the two front axles, keeping the broken glass on board to keep its weight for balance; let a man out on a rope through the front broken windows (not to rest his weight on the ground) who deflates all the bus's front tyres, to reduce the bus's rocking movement about its pivot point; drain the fuel tank, which is aft of the pivot point, which changes the balance enough to let a man get out and gather heavy rocks to load the front of the bus. Unload the bus. Wait until a suitable vehicle passes on the road, hijack it, and carry the gold away in it. Science teacher Mike Follows claims to have come up with a more practical ending. The opening sequence of the film featuring Beckermann driving his Lamborghini Miura through The Alps was filmed on the Great St Bernard Pass, Aosta, Italy, with the opening scene featuring the Dardanelli Viaduct, which was constructed in 1961. The large house featured momentarily during the sequence is the Maison de Refuge. The tunnel in which Beckermann abruptly meets his demise at the hands of the Mafia was shot at La Thuile on road SS26, Italy. The interior of the prison that held Bridger was Kilmainham Gaol in Dublin, Ireland - Noel Coward was a tax exile and couldn't film in Britain. The exterior, seen when Croker leaves, is HM Prison Wormwood Scrubs in west London. Upon his release, Croker stays at the Royal Lancaster Hotel in Bayswater, London. Denbigh Close, Notting Hill, W11, was used as the location for Croker's (Michael Caine) home. The highrise apartment where the Turin job is planned was the penthouse flat at Alembic House (now known as Peninsula Heights) on the Albert Embankment, owned at the time by Michael Deeley. The property was later seen in films such as Theatre of Blood (1973), A Touch of Class (1973), and Sweeney! (1977). It became the London home of novelist Jeffrey Archer. The training sessions shown for the Mini drivers were at the Crystal Palace race track in Upper Norwood, South London. The attempt to blow the doors off the bullion van, which led to its destruction and Croker's famous line, took place at Crystal Palace Sports Centre. The Crystal Palace transmitter can be seen in the background. The meeting at the misty funeral was filmed in Cruagh Cemetery, in the foothills of the Dublin Mountains. The office block that doubled as the Turin traffic control centre was Apex House, the Hanworth, Middlesex head office of the television rental chain DER. 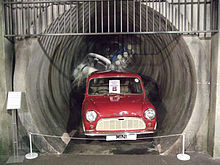 The chase sequences were filmed in Turin, except for the chase through the sewer tunnel, which was shot in the Sowe Valley Sewer Duplication system in the Stoke Aldermoor district of Coventry in the English Midlands, filmed from the back of a Mini Moke. The person on the far side who closes the gate at the end of sewer tunnel is the director, Peter Collinson. Collinson also appeared in the scene on the highway when the ramps get jettisoned, clinging to the right-hand rear door of the coach as the Minis enter at speed. During the getaway the Minis are pursued by police around the rooftop test track of what was then a Fiat factory in the Lingotto building in Turin. The weir the Minis cross in the car chase is just down river from the Ponte Vittorio Emanuele I at the end of Via Po in central Turin. A portion of the car chase was filmed as a dance between the Minis and police cars with a full orchestra playing "The Blue Danube" inside Pier Luigi Nervi's Palazzo Esposizioni usually used for the Turin Motor Show (now the hospital library). It was cut from the final version and appears as an extra on the DVD. The final escape from Turin was filmed on the road to Ceresole Reale via Lago Agnel and Nivolet Pass (the highway does not lead to France or Switzerland because it is a dead end). The bus was left hanging off this corner in the climatic ending. Roger Beckermann's orange Lamborghini Miura in the opening scene is actually two cars. The first was a Miura P400 that was sold as new afterwards. In 2015 it was unearthed by Iain Tyrrell, one of the world's foremost classic car experts and Lamborghini aficionado. The second car, tumbled down the chasm by the Mafia bulldozer, was another Miura that had previously been in a serious accident and was not roadworthy. According to the director's commentary on the DVD, despite the publicity the film would give to the Mini, the car's maker, BMC, only provided a token fleet of Minis and the production company had to buy the rest at trade price. Fiat offered the production as many super-charged Fiat cars as they needed, several sports cars for the Mafia confrontation scene, plus $40,000, but the producers turned down the offer because it would have meant replacing the Minis with Fiats. The Minis seen on screen carry registration numbers HMP 729G (Red), GPF 146G (White) and LGW 809G (Blue). As at July 2012, a DVLA query indicates that two of these plates may still be registered; these, however, are not the cars used in the film as the film cars had "future dated" plates to make them current with the release date of the film, and as such would not be road legal. There were also numerous detail differences between the Minis used during filming and the launch of the "G" year suffix. According to the "making of" DVD extra, the Minis used in the chase scenes were all destroyed in accidents while filming the sewer sequence. As Croker walks through the garage where the Minis are being prepared, viewers hear that "Rozzer's having trouble with his differential", and the back of the red Mini Cooper is jacked up where Rozzer is working. This is an inside joke since the Mini has front-wheel drive and does not have a rear differential. In the early 1960s, front-wheel-drive cars were new and asking a car mechanic to repair a Mini's rear differential was a popular snipe hunt. Gold cost $38.69 per troy ounce in 1968, so four million dollars in gold bars would have weighed about 3200 kg (7000 lb), requiring each of the three Minis to carry about 1070 kg (2300 lb) in addition to the driver and passenger. Since a 1968 Mini only weighs 630 kg (1400 lb), each of these vehicles would have had to carry 1½ times its own weight in gold. The coach at the end of the film was a 1964 Bedford VAL with Harrington Legionnaire Body, distinctive for its twin front steering axles. After its use in the film, the coach returned to commercial service. It was scrapped about 1990 after being in service with several operators, mainly in the Scotland area. The coach had to be reinforced behind the driver's seat so that when the Coopers came into the back they didn't crush the driver. Even though plating had been secured, the driver's seat was still pushed forward several inches, enough for the driver to be touching the steering wheel with his stomach. When the Legionnaire was on its way to Turin, it has London-Turin on the destination display above the windscreen; on the way back it had been changed to Turin-London. It also proudly displayed 'Charlie Croker's Coach Tours' logos on the rear and both flanks. Following the filming, the coach had its improvised rear doors welded and was used on a Scottish school bus route until the mid-1980s when, according to the Legionnaire register, it was scrapped. However, it can be found on the roadside at New Invention, Willenhall, West Midlands. Charlie Croker picks up his Aston Martin DB4 convertible from a garage after release from prison. The scene was mostly improvised, which caused visible lighting irregularities since the crew did not know where the actors would be. The location of the underground carpark and lift is now part of Park Lane BMW, London. The original DB4 belongs today to a private English collection. According to several sources, the "Aston" pushed off the cliff was a Vignale Lancia Flaminia mocked up as an Aston. The two E-type Jaguars that suffered from the Mafia's revenge were restored to original condition, the red one of which is owned by Phillip Porter, the founder of the Jaguar E-type owners club. The black Fiat Dino coupé of Mafia boss Altabani was bought by Peter Collinson but became so rusty that only its doors remain. The Italian police cars seen around Turin were Alfa Romeo Giulias. The Italian police armoured car which escorts the gold convoy is a conversion of a former Second World War American M8 Greyhound armoured car. The original 37mm gun was removed and replaced with a water cannon. A Land Rover Series IIa Station Wagon, registration BKO 686C, was used to get to the convoy before attacking and was modified with window bars and a towbar. A Ford Thames 400E van was used for the football fans' decorated van; this was referred to as the Dormobile, the name of a common camper-van conversion coachbuilder. The cross-Channel ferry featured in one scene is the MS Free Enterprise I. The ship spent many years as a day cruise ship in Greek waters before being scrapped in 2013. The "Chinese" plane delivering the gold to Turin is a rare Douglas C-74 Globemaster, of which only 14 were built and only four passed into private ownership. It had been abandoned in Milan by its owners and was moved to Turin for filming. It was destroyed by fire in 1970. The music for the soundtrack was written by Quincy Jones. The opening theme, "On Days Like These", had lyrics by Don Black and was sung by Matt Monro. The closing theme, "Get a Bloomin' Move On" (AKA "The Self Preservation Society"), was performed by the cast and had lyrics featuring Cockney Rhyming Slang. Many incidental themes are based on British patriotic songs, such as "Rule, Britannia! ", "The British Grenadiers" and "God Save the Queen". The film opened at the Plaza Cinema in London on 5th June 1969. Poster for the American release of the film. The relative lack of success for the film in the United States was blamed partially on what was seen as an unattractive and misleading advertising campaign. The film has received generally positive reviews. On Rotten Tomatoes, it holds an approval rating of 81% and an average rating of 7.4/10, based on 27 reviews. The website's critical consensus reads, "The Italian Job is a wildly fun romp that epitomizes the height of Britannia style." Most positive reviews focus on the climactic car chase and the acting of both Michael Caine and Noël Coward, complimenting Peter Collinson's directing. It is considered highly evocative of 1960s London and the era in Britain as a whole. In a modern review Nik Higgins of Future Movies claims that the film makes Austin Powers's wardrobe appear 'drab and grey'. He compliments Michael Caine's ability to effectively portray the character of Charlie  and also praises the music of Quincy Jones. Higgins particularly highlights how the music 'hops between smooth lounges' like the opener "On Days Like These" and the latter "Get a Bloomin' Move On" ('The Self Preservation Society'), which plays near the film's end. It has also received some negative reviews, focusing on what is perceived as a predictable chase and a lack of real emotion. Vincent Canby, writing at the time of the film's release, felt that the caper film had been made before and much better as well. He complimented the film's technological sophistication, only criticising what he saw as an 'emotionally retarded' plot. Canby also expressed concern that Coward's appearance in the film, although intended to be kind, 'exploits him in vaguely unpleasant ways' by surrounding his character with images of the royal family, which had not knighted him at the time. A contemporary review in Time magazine felt that the film spent too much time focusing on the film's caper as opposed to building the characters; it also criticised the car chases as 'dull and deafening'. Although it received a Golden Globe nomination for "Best English-Language Foreign Film", the film was not a success in America. Caine blamed its failure on unattractive and misleading advertising. As a result, plans for a sequel were shelved. The movie was the 14th most popular at the UK box office in 1969. The film remains popular, however, and is considered one of the greatest British films in modern polls. James Travers of Films de France believes that the film's enduring appeal rests in the 'improbable union' of Michael Caine, Noël Coward and Benny Hill, whom he considers "three of the best known [British] performers... in the late 1960s". He states that the film has a cult status and stands as a 'classic of its genre'. A novelisation of the film, written by Troy Kennedy Martin and Ken Wlaschin, was published by Sphere Books in 1969. The book contains numerous differences to the film: for example there is a rival group of German gangsters called the Hamburg Syndicate who try to obtain Beckerman's plans for the robbery, Croker and the three minis travel to Italy by yacht, and Professor Peach is rescued by the gang after he is arrested. The ending of the novel is also significantly different. The bus successfully crosses the border into Switzerland and two days later the gang and the gold arrive on a beach near Dover in a landing craft where they are met by Mr. Bridger and Luigi Altabani. Mr. Bridger tells Charlie Croker that they have come to an agreement to "divide Europe" and that the gold must be given back to the Italians. Since 2000, there have been two remakes of the film. The first was released in 2003 and also called The Italian Job, set in Los Angeles and starring Mark Wahlberg as Charlie Croker. It features Donald Sutherland as John Bridger, played as more of a father figure to Croker. It employs the updated Mini Cooper for a chase towards the end. An official Bollywood remake of the 2003 film, called Players, was released in 2012. There is a video game based on the 1969 film, released for the PlayStation game console in 2001 and Microsoft Windows in 2002 and published by Rockstar Games. Michael Caine's performance and 'bloody doors' line has been parodied in several British comedies, and in a music video for Pick a Part That's New by Stereophonics. Large portions of the car chase scenes were lifted directly from the film for use in the MacGyver episode "Thief of Budapest" (Series 1, Ep 3) with the main characters setting up the story with three Minis visible at the start of the episode. Most of the end of the episode is footage from The Italian Job. The film was also the subject of a play, Bill Shakespeare's "The Italian Job", written by Malachi Bogdanov, who used lines from Shakespeare plays to tell the story. It was performed in 2003 at the Edinburgh Fringe Festival. As part of a celebration of British culture at 2012 Summer Olympics, which were held in Great Britain, a replica of the bus was made and was exhibited balanced on the edge of the roof of The De La Warr Pavilion in Bexhill-on-Sea. The famous dialogue and car blowing up scene were shown at the closing ceremony. In September 2016, NBC and Paramount Television began work on a TV series inspired by the original and the remake. ^ a b "On This Day: The Italian Job". Art & Hue. 5 June 2018. Retrieved 5 June 2018. ^ "The Film – Soundtrack". The Italian Job.com. Retrieved 9 September 2007. ^ "November 2004: Issue 95". Total Film. Future Publishing. Archived from the original on 29 March 2006. Retrieved 29 May 2006. ^ Paterson, Michael (10 March 2003). "Caine takes top billing for the greatest one-liner on screen". The Daily Telegraph. Telegraph Media Group. Retrieved 8 February 2009. ^ "As If: 312 (Italian Job)". TV.com. CBS Interactive. Retrieved 4 January 2009. ^ "The Simpsons: The Italian Bob". TV.com. CBS Interactive. Archived from the original on 28 March 2009. Retrieved 4 January 2009. ^ "MacGyver: 103 (Thief of Budapest)". TV.com. CBS Interactive. Retrieved 4 January 2009. ^ "The Italian Job". The Italian Job. 27 October 2017. Retrieved 8 November 2017. ^ "Cars – Mini Coopers". The Italian Job.com. Retrieved 11 July 2018. ^ Smith, Mark. "'Hang on a minute lads, I've got a great idea!' Brexit, crisis management and sensemaking". The Conversation. Retrieved 19 October 2018. ^ a b "Caine reveals Italian Job ending". BBC News. BBC. 29 November 2008. Retrieved 11 August 2009. ^ Press Office (20 October 2008). ""Italian Job" cliff-hanger solution sought". Royal Society of Chemistry. Retrieved 11 July 2018. ^ Adams, Stephen (23 January 2009). "Cliffhanger climax to The Italian Job solved after 40-year wait". The Daily Telegraph. Telegraph Media Group. Retrieved 11 July 2018. ^ Follows, Mike (2018). "The Italian Job: An exercise in turning forces". Physics Education. 53 (6): 065008. doi:10.1088/1361-6552/aad787. ^ "Mews News". Lurot Brand. Spring 2010. Archived from the original on 21 September 2013. Retrieved 19 September 2013. ^ "iaintyrrell.co.uk/media". Retrieved 8 January 2018. ^ "Hisotical Gold Charts and Data". Kitco. Retrieved 29 May 2006. ^ Reed, Chris (2003). Complete Classic Mini 1959–2000. Croydon: Motor Racing Publications. ISBN 9781899870608. ^ Kuris, Jeremy (25 March 2002). "USAF Serial Number Search Results". Aircraft Serial Number Search. Retrieved 26 November 2010. ^ "The Italian Job (1969)". Rotten Tomatoes. Fandango Media. Retrieved 11 July 2018. ^ a b Travers, James. "The Italian Job (1969)". Films de France. Retrieved 16 October 2011. ^ Huggins, Nik (15 May 2009). "The Italian Job (1969)". Future Movies. Retrieved 11 July 2018. ^ "The Italian Job". TV Guide. Retrieved 16 October 2011. ^ Canby, Vincent (9 October 1969). "'Italian Job' and 'Ace High': Double Bill of Imports at Local Theaters". The New York Times. The New York Times Company. Retrieved 16 October 2011. ^ "Cinema: Britannia Waives the Rules". Time. 19 September 1969. Retrieved 16 October 2011. ^ Johns, Marjorie (1998). "Michael Caine in The Italian Job". Citizen Caine. Retrieved 12 June 2006. ^ "The World's Top Twenty Films". Sunday Times. 27 September 1970 – via The Sunday Times Digital Archive. ^ WENN (10 January 2011). "Michael Caine – The Italian Job Is Britain's Best Film". Contactmusic. Retrieved 16 October 2011. ^ Bhushan, Nyay (23 November 2010). "India to Remake 'The Italian Job'". The Hollywood Reporter. Prometheus Global Media. Retrieved 11 July 2018. ^ "#34: Thief of Budapest". The MacGyver Project. ^ Lathan, Peter (2003). "Fringe 2003 Reviews (20)". The British Theatre Guide. Retrieved 11 July 2018. ^ Goodenough, Tom (4 July 2012). "Meet the new Olympic coach". The Daily Mail. Associated Newspapers. Retrieved 13 August 2012. ^ "London 2012 Olympic Games end with a party". Channel 4 News. Channel 4. 13 August 2012. Retrieved 13 August 2012. ^ Andreeva, Nellie (28 September 2016). "'The Italian Job' Drama Series Inspired By Movies Set At NBC From Paramount TV". Deadline Hollywood. Penske Business Media. Retrieved 23 October 2016. ^ "The Italian Job (charity event)". The Italian Job (charity event).